A castle built in the typical square shape, protected by two drawbridges and a moat. In Orvieto. Those visiting the town of Orvieto will find the historical fortress of Rocca or Fortezza dell’Albornoz on the left side of the Piazza Cahen. The castle was founded by Spanish Cardinal Albornoz, under the orders of Pope Innocent VI and from the designs of Ugolino di Montemarte, at a site that once held an Etruscan temple and was meant to be a safe base for the Church in the area. Construction of the fortress, then known as the Rocca di San Martino, began in 1359. After the diplomatic and military victories of the Cardinal it was decided that a fortified structure was required in the town and construction begun on the fortress, built against the cliff then known as Porta Rocca. Work on the castle began at the expense of the local municipality and under the orders of Ugolino of Montemarte, a leading architect of military structures in Italy. The castle was built in the typical square shape and was protected by two drawbridges and a moat. In the year 1390 the castle was badly damaged and Antonio da Capri built a new fortress on the existing perimeter. The fortress was destroyed in 1395 and attempts to reconstruct it were unsuccessful until the mid-15th century. At that time another fortress was built in the same design as the original and with additional fortifications. When Pope Clement VII fled to Oriveto after the Sack of Rome in 1527 he wanted to ensure the city would have a supply of water if ever under siege. The Pope ordered a well to be built for the fortress and also had the famous Pozzo di San Patrizio, an artesian well, dug to ensure water would always be flowing into Orvieto. The reconstruction of the fort was completed by Paul II and Pope Urban VIII. Later it was restored by Alexander VII, as confirmed by the coat of arms gracing the front door. The castle was badly damaged in the year 1831 and in 1888 the outside ditches were filled for the work on the funicular railway and for turning the space into a public garden. There is a stone amphitheater at the center of the garden where shows, mainly horse racing, were held in earlier days and where the funeral of Giuseppe Garibaldi was held in 1882. Today the castle is open to the general public and the outside public gardens attract many tourists. Orvieto is a comune and city in the region of Umbria in Italy. The city is located on a flat summit of a volcanic tuff. The location of the city is one of the most dramatic in all of Europe as it rises above the vertical faces of the tuff cliffs. The entire picture is completed by the defensive walls of the city, which were built by the same stones. 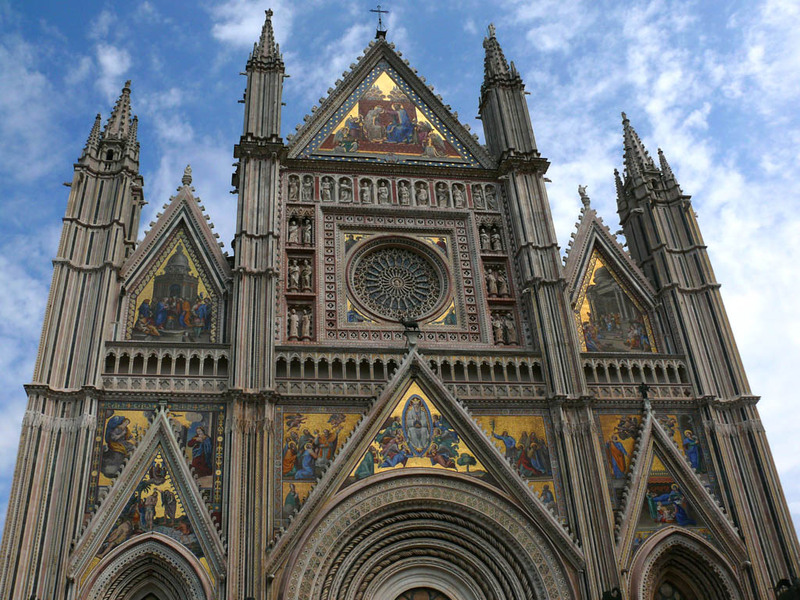 There are plenty of interesting places to visit in Orvieto besides the Fortezza, such as the city’s spectacular Duomo. The cathedral’s design is often attributed to Arnolfo di Cambio, but many scholars believe the master mason was an obscure monk known as Fra’ Bevignate. The cathedral was built with greenish black basalt and white travertine to give it a striped look, which can also be seen in the cathedral of Siena and many others from the same era. Lorenzo Maitani, a sculptor and architect from Siena, was called to design the façade and to stabilize the building. The choir was enlarged by Maitani and he also added two chapels. The façade itself is quite noteworthy and it includes many beautiful sculptures from the 14th century by Lorenzo Maitini. The San Brizio chapel inside the cathedral is decorated with beautiful frescoes done by Fra Angelico and the masterpiece is the Last Judgement done by Luca Signorelli. The tombs of the members of the Gualterio family are also located in the chapel. Another church in the city, San Giovenale, contains several frescoes from the 13th century. Visitors will also want to visit the Papal residence, which was the only one in existence outside of Viterbo and Rome. The first pope to spend time in the palace was Pope Adrian IV. Orvieto also has several ruins dating back to the Etruscan times along with the city walls, which are more than 2,000 years old. The Etruscan necropolis, Crocefisso di Tufo, is located at the foot of the butte and is surrounded by a vineyard and apple and peach trees. Inside the necropolis there are around a hundred chamber tombs arranged in a street-like grid. One of the most fascinating things about Orvieto is its mysterious underground city, where a series of tunnels and caves lie beneath the main surface of the city. These caves have been dug deep into the volcanic rock and there are plenty of secret hidden tunnels, which can be viewed on guided tours. The underground city has several cisterns, strange passageways, cellars, quarries, stairs, wells, galleries, tunnels and superimposed rooms with many small square niches. Several noble families had their homes connected to these tunnels so that they could escape safely in times of siege and the tunnels from the city palazzo would emerge at some place outside the city walls.